No need to lean closer to the screen, you read that title right: you should pay more for your talent management system. Of course, there are exceptions. If you’re paying $3,000 per user per month, your TMS is probably working wonders for you (or at least it should be). But if like most businesses, your talent management budget doesn’t exactly fill a Brinks truck, you’ll want to increase it. Get our Talent Management Systems Comparison Matrix. First and foremost, let’s look at how a good talent management solution can benefit you. It makes recruiting easier; continuously evaluates employee performance and engagement; helps you retain your best talent; and develops that talent into potential leaders. In short, there are a lot of valuable benefits. All of the above help you retain productive employees that keep your company innovating and succeeding. On top of that, retaining your employees helps your bottom line. There isn’t an exact metric on how much employee turnover costs companies, but none of them are pretty. As Zane Benefits reports, some studies show that replacing an employee can cost half to two-thirds of their annual salary. Other estimates show that replacing highly educated executives can cost up to 213 percent of their annual salary. That’s an absurd amount of wasted money. Because of this, 66 percent of CEOs rank improving their talent management strategy as a top priority. In other words, they realize how important talent management is in today’s business. The many benefits of good talent management systems aren’t the only reason why CEOs think it’s a priority. In today’s landscape recruiting and hiring is tougher than it’s ever been. According to Bloomberg, 2016 saw a record high for job openings in the US. This is a great sign for job seekers as they have a plethora of options. For companies, on the other hand, it’s more of a curse. They have plenty of openings, but nobody to fill them with. This created stiff competition for not only the top talent but talent in general. Job posting software Betterteam found that 2016 saw an 18 percent increase in hiring troubles for HR professionals compared to only three years prior. Between costly turnover costs, tough competition for talent and long hiring cycles, there’s a lot stacked against your HR department. But what does all of this have to do with your budget? We conducted a survey that compiled 18 months of conversations with talent management software buyers. We wanted to find, among other things, what challenges they faced and what their old vendors failed to do. 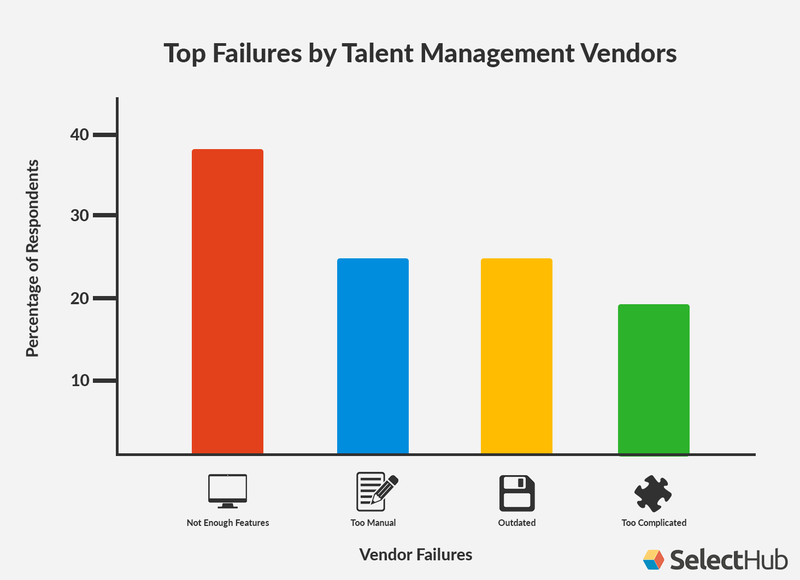 The most common vendor failures included a lack of features, too much manual work, outdated systems and overly complicated software. When it came to the challenges they faced in finding a new TMS, the overwhelming majority identified their budget. Specifically, 90% of the buyers we surveyed said that their talent management budget hindered them. Despite most human resource departments experiencing problems with their old systems — problems that make them less productive — they don’t have the budget to find a better vendor. They have to make do with systems that can’t do what they need and they can’t use effectively. This doesn’t correlate at all with how high a priority most CEOs place on talent management. And it certainly isn’t compatible with the competitive landscape of the recruiting process. The disparity between the recognition of the problem and the lack of a solution is striking. In order to truly prioritize talent management, you need a budget that matches its importance. You need to be able to invest in one of the most robust vendors that offers all of the features you need. And their system also needs to be easy to learn so your HR pros can use it as soon as it’s implemented. Yes, we realize that the best systems typically come with an increased price tag. It’s certainly a tradeoff. But as you can see, talent management is more important than ever. By reducing turnover costs and bringing in the best talent you’ll make that money back several times over.